Perhaps the most visible labour shortage in Hawke’s Bay affects our fruit industry. BayBuzz asked some informed players for their opinions on the issue. 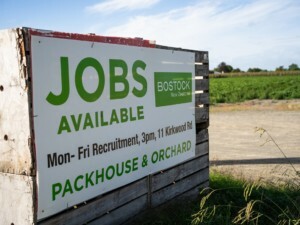 Bostock New Zealand’s crop doubles over the next five years and the company is very short of labour now to pick the crop. Unless the Government takes a longer term view and gives certainty for labour supply the company will have no option but to stop expansion plans. Tourists are welcome and can help us in the short term. But they are only here for a week or two, posing challenges around training and accommodation, with no long-term security. We need certainty and reliability. The Recognised Seasonal Employment scheme is a better solution. RSE workers provide security and certainty. They come every year for 6-9 months and we know they will be here to pick the fruit. By having overseas workers do seasonal work the company is able to train, take on, and create more full time quality jobs for New Zealanders. Although Bostock New Zealand takes New Zealanders first, there are less NZers available than any other year due to record low unemployment numbers. NZ workers are simply not available for seasonal work. Availability of NZers for this type of work is the issue. The new proposals for RSE workers is helpful but will not address the immediate pending chronic shortage in low skilled work such as fruit picking. Bostock New Zealand does appreciate the coalition government review. We would like to work with the Government to find long term solutions to the labour shortage to ensure we can get the fruit off the trees at the optimum time. Short-term response should be RSE cap increases and better use of unemployed Kiwis in other regions, being offered employment, accommodation and other services such as the RSE employees get. This needs management and policing in my view. We do struggle to motivate kiwis to harvest the apples. A lot of the industry pay fair rates with some earning $350 a day and more for the top picking aces. It’s not a lack of money issue, this is a historical shadow that follows horticulture. 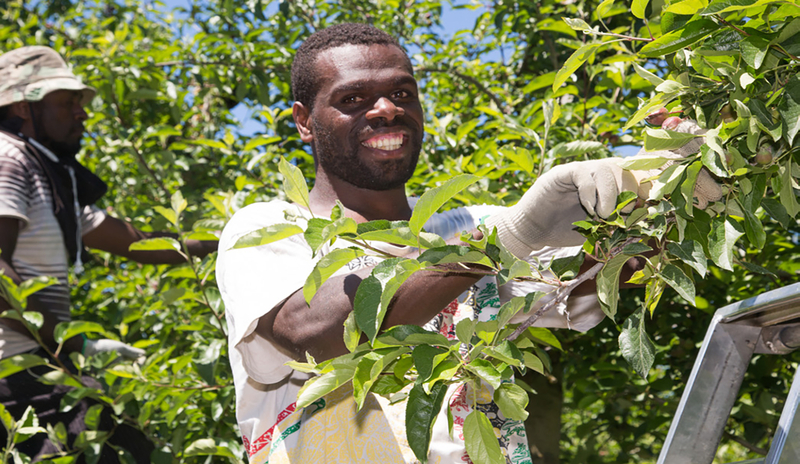 On top of seasonal labour, many are struggling to fill permanent positions in orchards. Rapid growth will see some companies needing to double their permanent staff over the next five years. Long-term solutions would include the use of the RSE platform as this is a very well controlled and policed seasonal labour scheme with tight regulations. (Tighter than what we have had in the 80s, 90s & 00s, and far more controlled than our mates across the ditch). Robotics will play a huge part in horticulture in the future. This will take some years to get to where we do not need seasonal labour; however great advances are being made globally with NZ at centre stage. We have become so reliant upon RSE workers that the ability to access labour through this scheme must now be an important part of any due diligence undertaken when considering new planting. We seem past the point of no return in terms of getting young unemployed New Zealanders into the orchards. I struggle with this, as the RSE workers take jobs that I believe Kiwi workers should fill; in addition, a significant percentage of the money these workers earn is remitted back to their homeland, therefore not circulating around our local economy. To address the first issue, we need to fundamentally change the education settings in order to allow students to train and earn money in recognised jobs and key industries whilst still at school – a big change that would allow a smooth transition from the discipline of the school environment straight into the discipline of the work place. Getting the ‘nefs off the couch’ is a lot harder than it sounds, as the reality is that the ‘nefs’ just won’t get off the comfortable couch after 12 months of nothingness to pick fruit. The industry also needs to take a hard look at the value proposition it offers potential workers. To be honest, it’s hardly attractive. Growers need to look at, for example, the pay rates they offer to ensure employment provides at least a living wage over the picking season. This aside, the stark reality is that we need more RSE workers to pick our fruit. The government must ensure we have enough workers to allow growers to maximise their crops (as well as grow and expand if this is their strategy), maximising for the region its economic potential and for the country its export earnings. When HB had 10% unemployment in the winter, a whole lot of unemployed came off the sidelines for seasonal work. In 2018 the unemployment rate was 4.3%. Good news for HB, but a bit of a problem for growers. An economist wrote recently that future food production was going to be based on itinerant labour and mentioned the NZ RSE scheme as a standout example. It is. It’s now the biggest foreign exchange earner for Samoa (and probably Tonga and Vanuatu).All we need is a few months of extra labour. Meantime, our permanent employees in the sector are growing faster than the RSE numbers and wages are going up too. In time automation will replace labour, but more in the packhouse; robotics don’t mesh too well with the ambiguities of the biological world. We are now growing fruiting walls and moving towards platform harvesting. I think we can eliminate ladders, making us 20-25% more labour efficient. It will take time – about two decades should do it. Allowing people on tourist visas to work would help in the short term. But most tourists have a schedule and won’t change flights and send passports off to Wellington for visa variations. The only way to change that is to let them know with a bit of notice that they can work for a few weeks. We also need to build accommodations for workers, but the RSE scheme is a year-by-year deal with no certainty on numbers. We need a multi-year deal to allow confidence to build accommodations. Pay rates in horticulture are so low there’s a pay crisis. Even holidaying seasonal workers from Europe don’t believe it’s worth their time. The work is seasonal, so it’s typically insecure work and pay rates need to reflect this. It also requires skill for staff to become fast at the various roles within horticulture, again pay rates need to lift to reflect this. Horticulture is one of our top exporters and earns the country a lot of money, yet the pay rates just don’t match up. It’s highly unethical that so many companies in horticulture choose to pay minimal rates when we know the minimum wage has not kept up with the cost of living. More alarmingly, a 2017 audit showed that more than half of Bay of Plenty’s kiwifruit audited employers failed to meet the bare minimum of basic employment standards and we haven’t seen any evidence that this has improved. In fact we have seen more exploitation and even trafficking cases emerge from horticulture … trafficking in New Zealand of all places, that’s horrific. We want to see a horticulture sector that values its workers. We need a concerted, collaborative effort that seeks to make seasonal work more sustainable and attractive. One mechanism that we could use to do this would be to develop Fair Pay Agreements which would give additional protection to migrant workers, prevent exploitation and stop the race to the bottom on wages that has characterised seasonal work until now. It would mean good employers wouldn’t be undermined by bad employers and it would raise the bar for the whole sector. The apple and pear industry is working hard across the technology, social and economic space to find long-term sustainable solutions to their labour needs. The industry has created permanent pastoral support teams within most if not all of the medium-to-large sized businesses; and developed strong collaborative relationships with MSD, MBIE, Corrections and local Iwi groups looking to support and guide people into employment, whether in full time or casual roles. In the short term, the industry is doing all that it can to encourage and support New Zealanders into work. However, with the Hawke’s Bay economy doing very well and unemployment at a historical low, the gap between labour demand and supply is growing. The RSE scheme has been hugely successful in bridging that gap, giving businesses confidence to invest and grow, thereby creating real and sustained opportunities for local people to take up rewarding full-time careers in the sector. Longer term, technology is crucial. While robotics and automation are being worked on, it will be some years away before robotic fruit picking is a commercially viable solution. For a start, the architecture of our trees needs to change significantly to enable machines to be used widely. Pack-houses will see faster adaptation to robotics and automation. The perception of the apple and pear sector as offering a career of choice is a key focus. The industry is working on a number of initiatives to raise awareness of the innovative vocational options that are available today. Bumper crops are expected this season, but where are the pickers going to come from? This is a huge issue to all growers and a major industry concern. Last year, when the cap for RSE workers was lifted, the situation was alleviated for a short time, but it required a lot of pressure for the Government to admit we are still short of labour. Additionally, the Government has just declared a seasonal labour shortage, which will help in the short term allowing visitors to work and removing benefit stand-down periods. But what about a long-term solution? The Government was aware of the proposed growth on the Heretaunga Plains. Simply put, there aren’t enough local workers to do the job, so we rely on RSE workers who are critical to orchard production. The Government has announced a review of the RSE scheme sometime in 2019. It needs to be done early so the 2020 crop, which will be even larger, can be picked. RSE workers need accommodation and pastoral care investment, but the current annual review process gives growers no certainty to plan or invest. Let’s hope the RSE review provides that certainty. As a food-producing country, it is a criminal waste to see good food either rot on the trees or on the ground. I believe the Government needs to be flexible and act decisively. We need to find a solution that meets the needs of growers in 2020 and beyond to provide confidence and certainty.